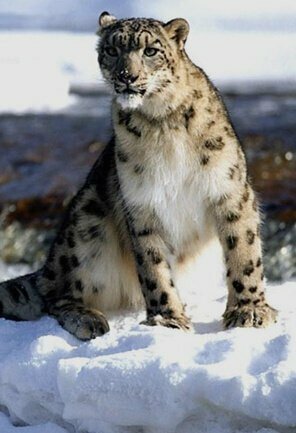 The Himalayas hold many wonders and not one is similar to the last. 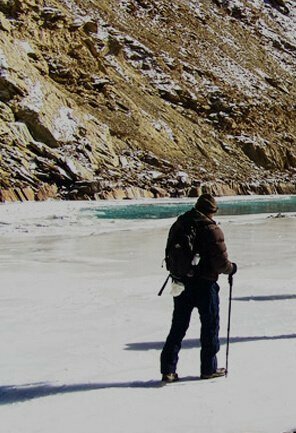 From mesmerising snow-capped peaks to brown arid Winter land to scenic Kashmir valleys, Himalayas is an affair with nature. Right from the moment you enter the Himalayan airspace, you know what’s in store for the amazing 16N/17D Ladakh, Zanskar & Kashmir tour. The welcoming Himalayan peaks from your aeroplane window is a teaser of the infinite beauties Himalayas has to offer. 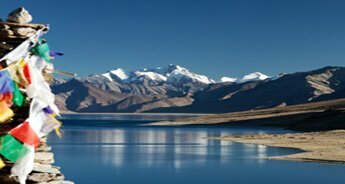 Leh and Ladakh are one destination which needs no introduction but if we were to describe it in one word, it would be ‘magical’. 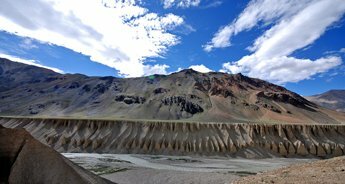 The vast arid cold desert with tiny hamlets of Ladakhi villages make up for a sight to behold. 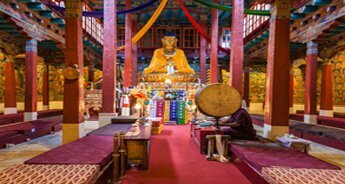 Apart from scenic landscapes, Leh and Zanskar offer an insight into the Buddhist cultures and traditions through their numerous monasteries. 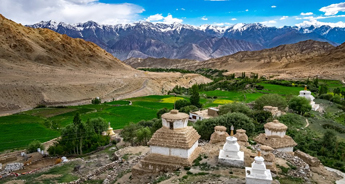 The serenity of Buddhist can even be witnessed in the villages en route Leh and Ladakh. 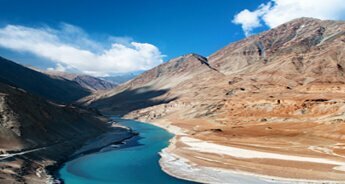 From the arid wonderland of Ladakh and Zanskar, we move to mesmerising valley and meadows of Kashmir. Into the heart of Kashmir lies the enchanting city of Srinagar. A city of eternal romance, Srinagar is a testament to the beauty of nature. From the serene Dal Lake to lush green Mughal gardens to historic sites, Kashmir will leave you wanting for more. Arrival at the Leh Airport. 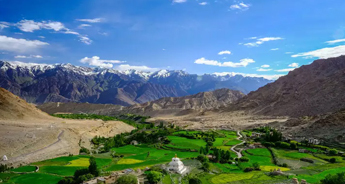 Flight to Leh is one of the best flight experiences in the world with the view of scintillating Himalayan peaks like K2, Nanga Parbat and many other smaller peaks. 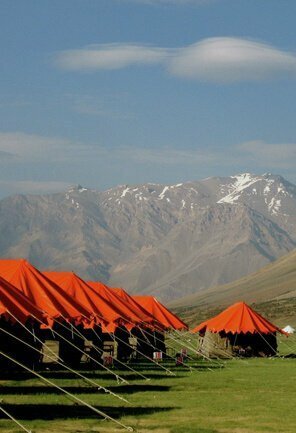 You will be welcomed by our executive at the airport, followed by checking in at the hotel in Leh. Rest of the day is for relaxing and acclimatising, followed by welcome tea at the hotel. 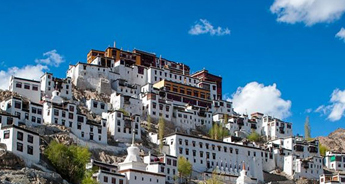 Visit Leh Palace which was the former palace of the king of Leh, followed by visit Shanti Stupa and Leh Market. Dinner and overnight stay at the hotel in Leh. Breakfast served at the hotel after which we will proceed to explore the monasteries of Leh. The first monastery on our list is Spituk Monastery which was built in the 15th-century Grags ‘bum-lde’s reign. 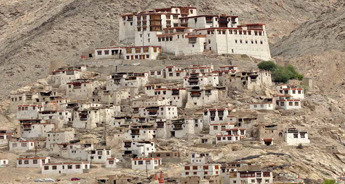 Built like a fortress, the monastery is of great cultural and religious heritage to the people of Leh. Visit the Hall of Fame, a museum built by Indian Army. Depicting the years of Army history in the region and housing the weapons, the museum is one of the must-visit places in Leh. 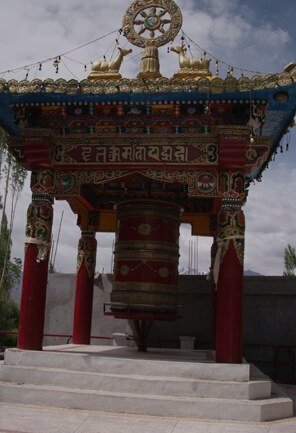 After lunch, proceed to explore the Sankar Gompa, located 3 km from Leh. 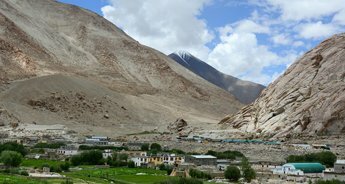 Belonging to the Gelukpa sect of Buddhism, the monastery is believed to be more than 500 years old and a famous tourist destination in Leh. Return back to the hotel for dinner and overnight stay in Leh. Early breakfast is served at the hotel after which the caravan will depart for Nubra Valley via Khardung La Pass. 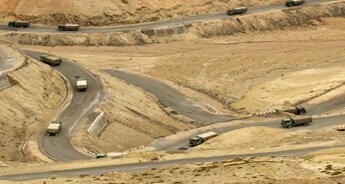 Khardung La is the world’s highest motorable road, 5600 metres above sea level. 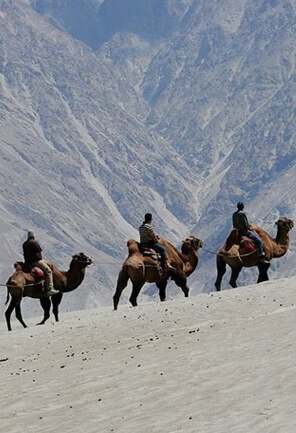 Upon arrival at Nubra valley, check in the hotel and relax. Evening exploration of the city is an optional excursion for you. Explore the local lifestyle. You can also visit the local homes of Ladakhi people. 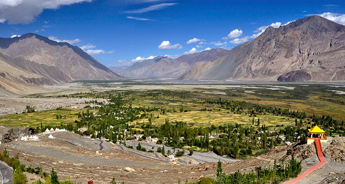 Dinner and overnight stay at the hotel in Nubra Valley. TheAfter an early breakfast, leave for Hunder. Upon driving to Hunder, between Hunder and Diskit, you will come across various sand dunes, resembling the sand dunes of Thar Desert. 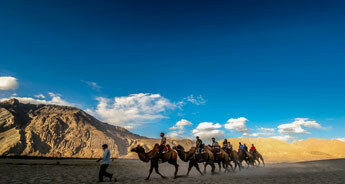 Upon arriving at Hunder, experience the Bacterian camel ride. Baterian Camel is famous for its double hump. 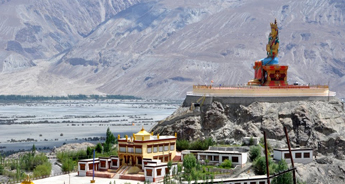 Upon returning to Leh from Hunder, stop at Diskit to explore the Diskit monastery. The monastery is more than 500 years old, overlooking the valley and the village. 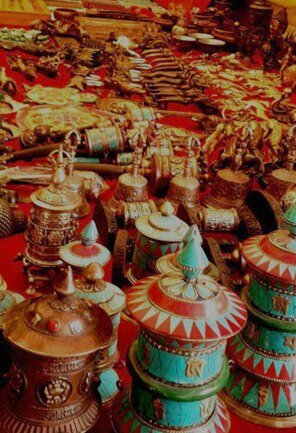 Explore the local market of Diskit and local lifestyle. 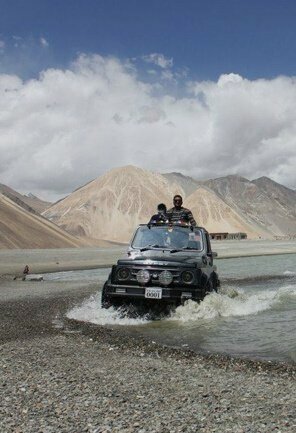 Return back to Ladakh for dinner and overnight stay at the hotel in Leh. 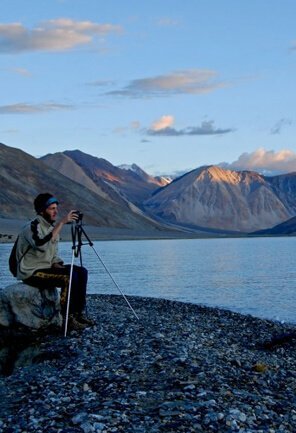 An early breakfast followed by driving to Pangong Lake which is approximately 140 km from Leh. 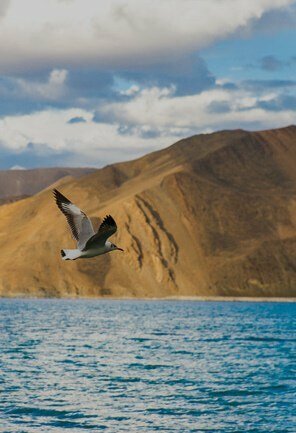 Enroute Pangong Lake, stop to explore the Shey Palace which was the ancient capital of Ladakh. 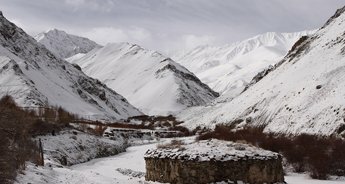 5km from Shey Palace, we reach Thiksey, which is famous for its Thiksey monastery complex. 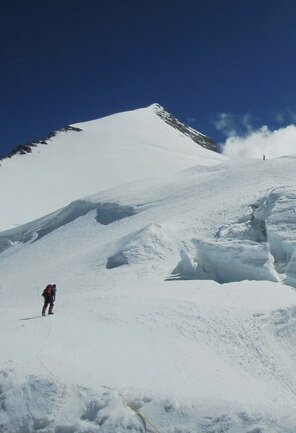 From Thiksey we proceed to Chang La Pass which is situated at an elevation of 5486 metres above sea level. 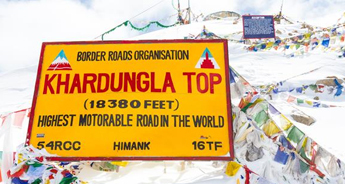 Chang La Pass is one of the highest motorable roads in India and one of the most picturesque locations in India. 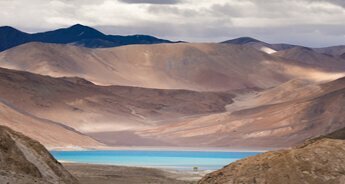 From Chang La Pass, proceed to Tangtse village, where the caravan stops for a cup of tea before proceeding to Pangong Lake. 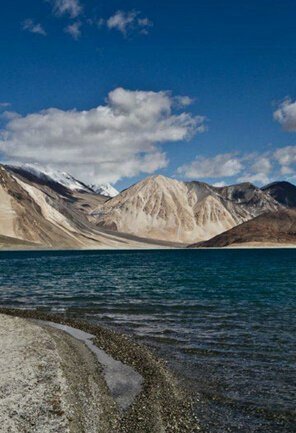 Upon arrival at Pangong Lake, proceed to the campsite. 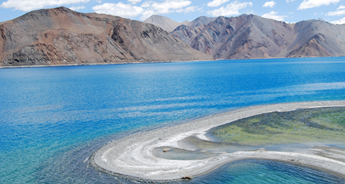 Pangong Lake is 5 km wide and more than 130 km long, sharing its water with both India and China. 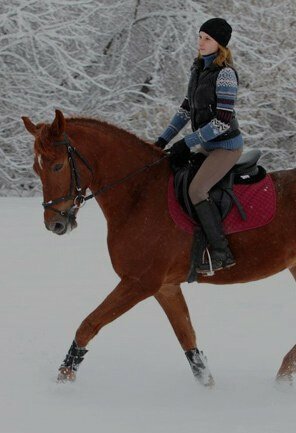 Check in the camp. 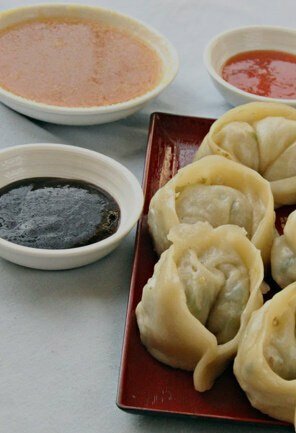 Dinner and overnight stay at the camps near Pangong Lake. The morning starts with a scintillating sunset by the lakeside. Breakfast served at the campsite. Drive back to Leh for dinner and overnight stay at the hotel in Leh. Early morning breakfast served at the hotel in Leh after which we will proceed to the Leh-Kargil Highway. Enroute Kargil, stop at Gurudwara Patthar Sahib. It is believed that a rock was nestled in the centre of the proposed road and despite multiple efforts to remove it, nobody could even move it an inch. 4 km from Gurudwara Patthar Sahib lies the physics-defying Magnetic Hill. Stand on either side, the road will appear to be ascending but your vehicle will go downhill on its own, creating an optical illusion. 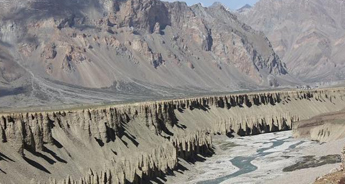 Drive to the confluence of Indus river and Zanskar river. 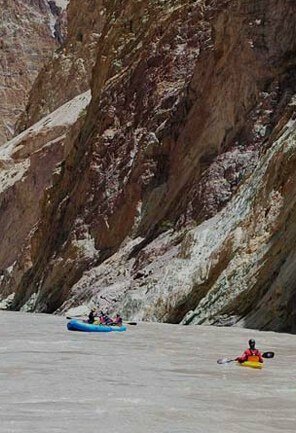 The scenic confluence of the river is a sight to behold. Next stop on the list is Likir Monastery. Situated on a hill in the Likir valley, the picturesque monastery is a major cultural hub for the locals. Upon reaching the monastery, you will be greeted by the colossal gilded image of the future Bodhisattva. Drive further to Tingmosgang campsite for dinner and overnight stay. Early breakfast at the campsite in Tingmosgang after which we will proceed to drive to Kargil. 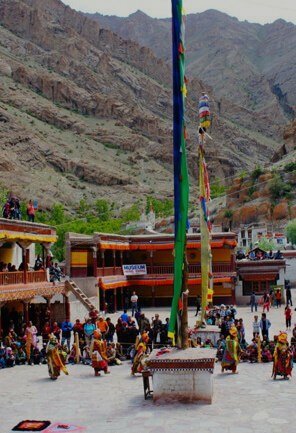 Enroute Kargil, visit the Lamayuru Monastery, which is nestled on the top of a hill in Lamayouro. From Lamayuru Monastery, drive to Moon Landscape, which resembled the hilly landscape of Moon. 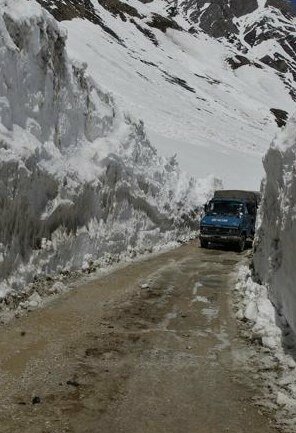 Drive to Kargil over Fatu La which is situated at an elevation of 13,489 feet and is the highest motorable pass on Leh-Srinagar Highway. Arrive at the hotel in Kargil and check-in. Dinner and overnight stay at the hotel. 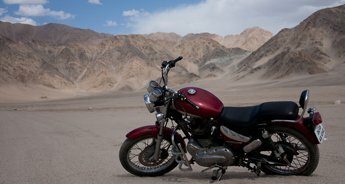 After an early breakfast at the hotel in Kargil proceed towards Rangdum which is 6 hours drive from Kargil. Upon arrival at Rangdum, check in at the hotel. Dinner and overnight stay at the hotel. 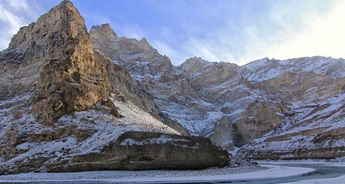 After a lip-smacking breakfast at the hotel in Kargil, depart for Padum, which is 5 hours drive. Enroute Padum via Suru valley, stop at Sani Monastery. Belonging to the Drukpa Kagyupa School, the entire monastery is believed to be built in parts by various rulers. Arrival at Padum followed by checking-in at the hotel. Dinner and overnight stay at the hotel in Padum. 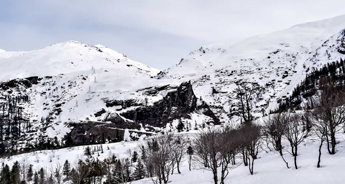 After a lavish breakfast at the hotel proceed for Karsha and Bardan sightseeing tour. The first destination for the day is Karsha Monastery. Situated in the mesmerising Karsha Village, the monastery stands tall on a hill that can be seen from a distance. From Karsha Monastery, we proceed to Bardan Gompa. It is a 17th-century Buddhist monastery, belonging to Dugpa-Kargyud monastic order and first of its kind. Drive back to the camp for dinner and overnight stay. After an early breakfast at the camp, the caravan proceeds to the monastery of Stongdey. 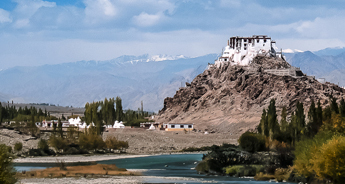 The second largest monastic establishment in the Zanskar region, the monastery is associated with Tibetan Yogis and Marpa. 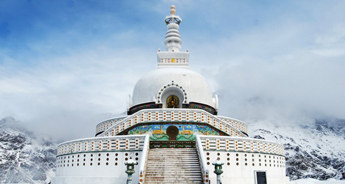 After that, proceed to Zangla which is nestled deep in the Indian Himalayas. 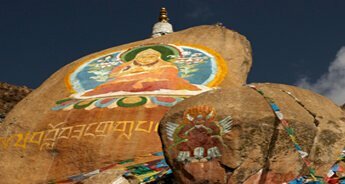 Visit the Zangla Monastery after which we return back to our camp. After a lavish dinner at the campsite, proceed to Rangdum, which is five hours drive. Upon arriving in Rangdum, check in at the hotel. Dinner and overnight stay at the hotel. 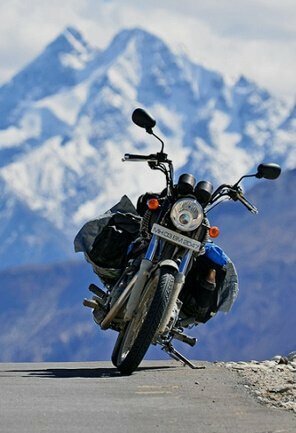 After a lip-smacking breakfast at the hotel, proceed towards Kargil which is 6 hours drive. Upon arriving at Kargil, check-in at the hotel. Dinner and overnight stay at the hotel. After an early breakfast at the hotel after which the caravan will depart towards Srinagar. Enroute Srinagar, stop at Drass which is the second coldest inhabited place on the Earth. 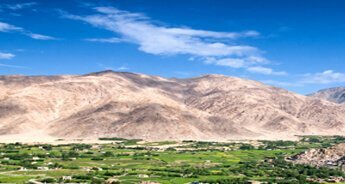 From here you can have the panoramic view of the Kargil hill and Tololing Peak, which were famous Kargil War peaks. Visit the Vijay Smarak to pay tribute to the soldier who sacrificed their lives during the Kargil War after which proceed towards Srinagar. Upon arriving in Srinagar, check in at the hotel, after which you are free to explore the mesmerising city. Dinner and overnight stay in a houseboat. After a lavish breakfast, we will embark upon exploring the enchanting city of Srinagar. The first destination on our list is Shankaracharya Temple and Mughal Gardens. Shankaracharya Temple is situated on top of Shankaracharya hills. The temple is devoted to Lord Shiva. Mughal Garden is also known as Shalimar Bagh which is a Mughal style garden, connected to Dal Lake. The next destination is Nishat Bagh which is also referred to as Garden of Joy. Located on the east side of Dal Lake, Nishat Garden is also similar to various other Mughal gardens in India and it is the largest Mughal garden in the valley of Kashmir. After Nishat Bagh, we head to Shalimar Bagh. Connected to the northeast channel of Dal Lake, Shalimar Bagh is a Mughal garden built by Jahangir for his wife Nur Jahan. Return back to the houseboat for overnight stay and dinner. After a lavish breakfast in Srinagar, we depart for the Srinagar Airport, marking the end of Ladakh, Zanskar and Kashmir Tour.